With the Leafs clinging to their playoff lives by a slippery thread, some fans are already turning their thoughts ahead to "next" (as in the everlasting sports cry- 'wait 'til next year'...) year. Fair enough. A lot of the enjoyment of being a fan of a team in any sport is watching your team build its roster, because that creates hope for the future- even if the current situation seems a bit dismal at times. Here in Leafworld, I sense there is a somewhat widespread belief that President (or whatever his title is) Tim Leiweke has a magic touch and will be doing whatever it takes to turn the Maple Leafs into a winner. Count me in the seemingly small group that doesn’t buy it—or him—for a minute. I respect the views of everyone who posts here at VLM, and I think a fair number of visitors here like Leiweke a lot. I expressed in a post several months ago why I don’t, and in truth, my views haven’t changed much. There are three key aspects to any job like Leiweke has—one is setting a tone in the building, another is hiring the right (best) people to run your team (in this case, the Maple Leafs). And then there is the public relations, for lack of a better word, side of things- essentially how you handle yourself as the executive face of the organization. I have no idea what kind of tone he sets in the offices of Maple Leaf Sports and Entertainment. But I’m sure he is a smart, passionate guy who knows business—and lots of famous people. I’m not in the building so don’t have a clue, but I’ll take a guess and say he inspires staff to be their best, and so I’ll give him a check mark there. That’s good. That was all bad enough. It’s just that he seems to continue to want to talk about the whole “culture of losing” thing in Toronto, as though he is an expert in building championship teams. All he is doing is tearing things down so he can (in his mind) look good to people when "his" teams get better. That “his” LA Galaxy soccer team won championships is nice and everything, but he essentially bought superstar talent to win in a third-tier soccer league. It worked and that’s great. He is now doing the same with Toronto FC, which is fine. But again, MLS is what it is. It’s not the NHL. The LA Kings won a Stanley Cup, but he was hardly the guy making the trades and building that roster, and certainly was not the coach—or the person who hired the coach who turned the team around and won a Cup. You’ll say, “Michael’s, that’s not his job—he’s there to bring in the right people”, as noted above. And I agree. But how much credit do we want to give Leiweke for the success of the LA Galaxy and the LA Kings? Here in Toronto, he gave Dave Nonis an extension when it was nowhere near necessary—or necessarily prudent. Nonis is certainly a good hockey man, but the industry is filled with such guys. Is Nonis the very best executive the Leafs can attract? Turning the Leafs into a Cup winner won’t be nearly as easy as it was in a 'sort of' professional soccer league. The relative success this season of the NBA Raptors this season is interesting (and they do have some talented, hard-working players) but the Eastern Conference in the NBA is seemingly dreadful. I’m not enough of a basketball guy at this point in my life to know how many of the current players on the roster have anything to do with the General Manager that Leiweke hired last summer. The coach, who is really responsible for the turnaround as best I can tell, was there long before Leiweke. In any event, my bigger concern with Leiweke continues to be his public comments, which inevitably leave me agitated and dumbstruck. Let me take a step back: I was never a Brian Burke guy (though I know many of the people visiting here swear by Burke). I just wasn’t. 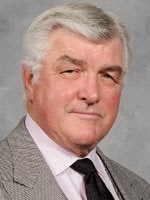 He is a very good hockey man—shrewd, hard-working and, like our current coach, has a Cup on his resume with a team nicely built by his General Manager predecessor in Anaheim. So while Burke certainly helped to improve the Leafs (how can we not appreciate the trades that brought Lupul/Gardiner and Phaneuf here?) and is a respected hockey executive, my issue with him is that for a guy who was supposed to be about “team”, he sure spent an inordinate amount of time speaking about “me”, “my”, “I” and “mine”—and telling everyone how much he didn’t care what anyone else thought. In my experience, that’s usually a sign that a person cares way too much about what other people think. So my frustration with Leiweke is that he is almost a combination of the blustery Burke and the old Leaf/MLSE President, Richard Peddie. Leiweke at least seems to have some instincts for the sports world, while Peddie was a business and numbers guy as best I could tell, who meddled in the hockey and basketball side more than he should have over the years. When Leiweke speaks of a culture of losing and all that, I wonder how hockey people like Cliff Fletcher, Pat Quinn (right) and the late Pat Burns would feel hearing that? When Fletcher and Burns teamed up to take the Leafs to exciting “final four” finishes in the early-mid ‘90s (and very nearly an appearance in the finals in '93), did anyone think the Leafs were losers? When Quinn built contending teams year after year in his tenure here (and but for the vagaries of sport would have seen his squad in the finals in 2002) were the Leafs struggling with a culture of losing? I just find a lot of that kind of talk from the “top guy” (Leiweke) baffling, and a sign that he just doesn’t get it. So he has proven he has “contacts”. He can throw money around and wine and dine people. But in the NHL, you need to be smart—Lou Lamoriello smart. Ken Holland smart. Sometimes you have to be David Poile smart, as in building a consistent, well-regarded franchise on a financial shoestring. Business savvy, yes, but most importantly, hockey smart. So whatever Leiweke does, it is essential that if he does make changes this off-season, he hire the best people possible—and then get out of the way. And if possible, stop talking. Michael, to me Leweki's statement half way through the year --" I don't really KNOW who Dave Keon is" said it all for me. The realization that he probably still doesn't know brought me to the decision--I Don't really CARE who Leweki is. He doesn't believe there's a lot to be learned from history, I do. I haven't seen anything to change my mind about him....yet. C.N. Hi Colleen- not knowing who Keon is doesn't mean he can't be a very good sports executive, of course, but it does mean he hasn't got a clue about the history of the franchise he thinks he's saving. I don't really care that much if they fire Carlyle. He is not flawless and perhaps the team has quit on him, but unless there is somebody better out there I could see them giving Carlyle part of another season. However, I do blame Carlyle somewhat. I don't fully understand his systems and I think he was too reliant on his veterans and did not use his AHL guys enough to keep other core players fresh in an Olympic year. They seemed to win when Holland was in the lineup. I don't have personal feeling against Nonis, but I am not sure there is a better GM out there to replace him so he gets a pass from me for another year. I'm just worried they might do something stupid. Josh Leivo is just 20 years old and has 38 points in 54 games. That's pretty good for an young AHL rookie. Granberg is up to +25...again...pretty good for a rookie who is just 21. Please don't package up prospects and trade for another Clarkson. Try and sign the existing veterans to reasonable contracts and if they won't sign, let them go...open up some spots and give the prospects a shot at training camp. I guess all coaches are coaching to win games now, DP, so it's difficult to know if a new guy would show any more willingness to play the kids. "I guess all coaches are coaching to win games now." I have already given up on this season. I am mostly hoping for a better result next year. Perhaps his desire to do something new will allow him to see possibilities that will bring a positive energy to the team and thereby improve the product on the ice (in a previously undiscovered or unconsidered way). Who knows what ideas may be lurking at the ready for him to implement, if only he has ears to hear! I have no doubt he has some business acumen, InTimeFor62. Just not sure he is a fit, given his obvious disdain for Leaf history. It's one thing to look for constructive ways to make things better. But he sounds like he thinks he invented excellence- and that no one here before him ever considered striving for that. I have read your post a few times today, trying to come to terms with how I feel as a fan given what has gone on here in the last 10 years. I made a huge mistake when Burke was hired. I bought that he was going to be different, hook, line, and sinker. So as the old saying goes, fool me once, shame on you, fool me twice, shame on me. I don't buy what Leiweke is selling for most of the same reasons you don't. He sure as heck didn't invent accountability in management, or excellence. To me, it's just a lot of white noise, corporate speak, that others will parrot, so they can sound like they care about the fans. It's really about the money, we all should acknowledge that. Don't get me wrong, I'm sure he wants to win, they all do don't they? Or at least they would like to win unless it is going to cost them on the ledgers at the end of the season. I can't believe that Leiweke knows any more about how to build an NHL team than I do, and perhaps being an attentive fan, I actually might know more than he. The hubris of these guys knows no bounds really, Nonis is a GM, maybe a good one, not sure yet. I'm sure that he is better able to assess talent than Leiweke. Is Nonis the best GM available this offseason? Is Randy the best coach available? Those are indeed the important questions as we move forward. Whether or not Phil, Dion, or Kadri are the cornerstones of a championship franchise pale in comparison to the coach and GM. The wrong GM can devastate a team, just ask Mike Milbury. It's entirely possibe that Nonis and Carlyle are going to run this team into the ground. They certainly haven't shown any propensity to get them going in the right direction so far. I don't see Chris Pronger on the Leafs, or Crosby, or Towes, for that matter. From where I sit there is little evidence that either has much in the way of ability to assess talent. Lots of choices here, but Clarkson stands out. What a blunder that signing has become, it's ok Leafworld, MacArthur, the guy Carlyle hated and ran out of town to make room for Clarskon, only has 20 more goals at this point. We have talked about the team and whether or not they are the players you build around. I don't know for sure one way or another, so much is reliant on potential, and whether the players harness it. Today, I find myself with very little faith that this entire management team, has the wherewithal to accurately evaluate what it really has, and get the maximum return. This becomes doubly troubling when the subject is trading Kadri, Gardiner, or any other high end player. The players themselves have to share a lot of the blame for the train wrecks that the last 3 seasons have become. It's time that they grow up, own the fact that they need to improve, and do so. Tearful dressing room speeches are sad, but hollow. Maybe if some of them had bothered to play something better than Timbits level defense in the last 3 years, this wouldn't be a concern. We have also talked a lot about how young this team is. I am no longer willing to cut them any slack for this. The only player without significant NHL experience is Rielly, and I think everyone is pleased with how he has acquitted himself so far. The majority of this team has experience that this should no longer be a problem, we are making excuses for. The team and the fans need to stop making excuses, while pretending that next year will magically be better. You've captured a lot of important issues very well, Jim. I'm with you. This roster, one or two players aside, may be young but is in fact experienced. I tried to make a similar point on a recent VLM podcast, I believe. No excuses. And I also agree with the notion that if the players had done what they needed to do (good "system" of play or not, good coaching or not) there would be no need for lamentations. We would all just accept that they worked their tail off and came up short. But I'm not sure that's what's happened. I guess Tim Leiweke hasn't had long enough for me to be able to assess how good a job he's doing. He's made a few misstatements, sure, but I can't hang Reimer's performance, say, on him. we'l see if Leiweke becomes more sensitive to his teams' fans after spending a while here. I think we'd all agree there are far greater concerns for Leaf fans these days - and a swooning team predates Leiweke's arrival. What is it with this team over the past three years? That's the question I hope Leiweke will be asking. 18 wheeler two years ago, game 7 last year, and another collapse this year. And even though the players say the Bruins' debacle didn't affect them this year, how many times did they blow a lead in the third period? If we're honest, I think we'd say no lead was or is safe with this team. Getting to the "why" of that should be priority #1 for Mr Leiweke - and everybody associated with the franchise. We'll see how they do by this time next year, and can then assess what kind of impact our new CEO is having on the organization. There are bigger issues for sure, Gerund, but I'm not inclined to be as forgiving as you when it comes to the comments a leader has made in this market. Good leaders know their constituency. Michael, I wish i could say I have more optimism than you, but sadly I don't. That being said... lets turn back to another period that you touched on... Peddie's replacement of Quinn with JFJ. I lived out west during this era and was deprived of the day to day coverage that surrounded the move. I was under the assumption it was related to Quinn's health issues, not necessarily performance related. Could you shine some more light on this for me? Hi Dave- first, let me say that as I have long acknowledged here, I have had a professional relationship with Pat for many years. I would never try to speak for him but I will try to answer your question. My sense is that Peddie was looking to have Quinn stay on as coach, but wanted to hire a new GM. That was a decision by Peddie and I presume Larry Tanenbaum. If it was based on Pat's health, I'm not aware of that. Pat did have some health issues in 2002 but I believe it was simply an organizational decision. I may well be accused of bias, but it's not a decision I endorsed then, or now. Thanks! You would seem fortunate to have a relationship with Pat. From my chance meeting with him in Vancouver, he seems like an honorable sort. He is a fine man, indeed, Dave. In his early years as coach, the Toronto media may not have understood him, but I think there was a tremendous respect for him by the end of his time with the Leafs. He loved and appreciated his time in Toronto and has always had a special relationship with fans in Vancouver, Toronto and right across Canada. With respect to the Leafs, I have not seen anything from Lieweke to be positive about as yet. As you noted Michael, he has made strides with the TFC, but the NHL is not run in the same manner. You can't buy a cup contender, you have to build one. Since he's come to Toronto, all his actions (and words) concerning the Leafs have done nothing to build confidence, or the team. So here we are at this critical stage with the Leafs. What is the best way forward? Well, we are quickly going to see what Lieweke's vision is regarding the Toronto Maple Leafs. Like you, I'm worried. "Status quo" is no longer an option, and if the Leafs had made the playoffs (and maybe won a round), status quo would likely have been his choice (other than of course some new photos on the wall, and some PR preaching the team's progress). Lieweke's next steps will either move this team forward, or just make matters worse. I'm not optimistic, but he better not f*** this up! Substance and results over style and talk would work for me, Don (TML_fan)! Call me Missouri. I am the show me state. Talk is cheap. All I have heard from Lewacky (doncherryparody nailed the name for me after the infamous pictures comments) is salesman talk. I firmly believe MLSE hired him to bring an NFL franchise to Toronto and any thing else he does is gravy. MLSE knows it would be virtually impossible for him to kill of their Leafs cash cow. I'm from Missouri, too. My sense is it would be virtually impossible for almost anyone to wreck the MLSE money machine, Pep. Too many people like us feed into it, one way or another, because we care about the team and its history. If I were to build a team, having little hockey knowledge myself, the first thing I would do is to fill top level positions with the best hockey minds in the business. Does the Leaf Organization have these types in place? We see a few American teams that are contenders year after year because they do have the people in place to ensure success continues into the future. (Detroit, Boston...) They have money and they spend it to get the best. Other teams that are successful are smaller market teams (L.A.,San Jose, Tampa) who have less money but still spend to have the best people possible at the top because, without a competitive team, they would never survive. My question is: when we talk of team building does it not have to start at the very top of the organization, hiring the best throughout down to the scouts and coaching staff? And, do you think Leweki will spend the money to do so? There's always been a lot of money in Toronto but not a willingness to spend it. Unlike smaller market teams, they don't need to spend to survive, but what of the future? They won't lose their older fan base but without a competitive team they risk losing a large chunk of a younger generation of fans who have never seen the Leafs win a playoff round. Will they be as patient as those of us who at least have memories of better teams? The organization will soon be in a position where they have no choice but to spend to keep their fans. We older fans can't last forever. C.N. My sense, Colleen, is that MLSE has spent a fair bit to build the off-ice aspect of the organizations in recent years. Burke was paid a lot, and he was allowed to hire a lot of senior aides like Nonis, Poulin, Loiselle, Dudley et al. Leiweke will spend plenty- now it's a question of his determining if he has the right team in place right now with Nonis and his team and of course Carlyle and his staff. Is Leiweke the right guy to make these decisions on his own? Who are his non-internal independent hockey advisors? If not, while we can dream of pursuing Lamoriello or Holland or individuals of that ilk, my guess is the Leafs will have to find their own next great hockey executive. As much as I am not impressed by Lieweke, I am surprised that you focus on him. I just don't see him having a lot of impact in the dressing room. Beyond bringing his son-in-law into the organization (adequate player, but IMO he's on the Marlies without Lieweke's influence), I just can't see him having anything to do with, say, the team giving up so many shots. Nonis must be disappointed with the way his moves turned out - Clarkson never established a role for himself, Bolland injured - only Bernier has worked out this season the way imagined. Which to me brings me to the coach. I've never seen two players lambast their ex-coach as they're walking out the door, the way MacArthur and Grabovski did. That has to tell you something about how Carlyle relates to the dressing room. In the same vein, I still think the way Carlyle behaved in front of the cameras screamed to me "what kind of jerk talks to his players that way" in the HBO series. The contrast with Babcock was stark. And how is it possible that Babcock can get a team forced by injury to play so many rookies to play so well, when the Leafs can't? And what kind of coach allows his 1B goalie in Reimer to become so pissed off/ demoralized/ unconfident that his game crumbles at a crucial point in the season? I put Reimer's problems directly on Randy. Should we talk about Carlyle's refusal to adapt and use a younger fourth line in place of Orr and McLaren, who seldom played when dressed? Or how about being unable to find a way to get this team to play better defensively - not just over the course of the season, but this goes back throughout his time here. I was actually ready to cut the coach some slack because of the long period where they were down to two regular centres earlier this year. But the team came through that stretch better than many expected. Now, they're relatively healthy, but unable or unwilling to compete. Point your finger at the players if you want, and it is fair to do that. I don't doubt there will be changes because of the performance. But I think the real problem is Carlyle's personality and the way he treats the players, and that the team has written him off. A late surge and making the playoffs at this point would be more damaging than no playoffs, if it means Randy is here in September. I agree there are plenty of on-ice issues, and we've discussed those at length here for weeks. Discussions around the coach will be out there in the weeks ahead, no question, Steve. What really concern us fans at the end of the day is winning. This stupid notion that we need to be excited to win is idiotic. Nothing is more fun than winning and it doesn't matter how it is achieved. Personality management style aside, I would still give him the benefit of the doubt. I gather he wants to win, wants to be the man. What he does or how he go about it to me is unimportant. If he makes the right move to win, that all that matters. The next move however is what matters and I am sure he WILL make one or forces his team to make one that would be significant. It is meddling? You hire the people that you think can do the job and let them do it but if they can't, you will have to do something about it. However you put it, you'd be involved...meddled. You mentioned Peddie and surely I rather have Leiweki doing the pushing to win than playing political games. Michael, my feelings on Lieweke now just continue to validate the sick feelings I had about him last summer. He is a corporate suit, he is not a hockey person, he doesn't have a clue nor does he care about the rich history of this team, and frankly, I don't think he cares as much about winning as he does stroking his own ego. Burke I believe wanted to win badly, but he also had the ego galore. I have my own ideas about roster moves now and moving forward, who the Leafs should invest further in and who they should look to get rid of. I guess we all have our opinions there. By and large, however, I look at this roster and I still believe there is as much pure talent on this team as there is on most other rosters in the league. You have raised the question a couple times, what is the Leafs system? We still don't know. We saw a system worked to perfection by the Blues last week in the first period. Take a look at that team. Superstar players? Incredibly gifted athletes that stand out on the ice? Elite goaltending? None of that. Miller is of course a great goalie, but Halak and Eliot both seemed to give up less than two goals a game the past couple years there as well. They have a plan, a system, and their team plays it to perfection. That is the reality in today's NHL. Defensive breakdowns, getting thrown off your game, playing one-on-five, and having the wrong players on the ice in the wrong situation are things that great coaches minimize. So that to me is what it comes down to. I have never liked seeing coaches always be the scapegoat, and I realize that they are now more than ever with rosters protected by salary cap realities, but it has become increasingly clear to me that Carlyle has simply not brought this squad together to play a definable game. Heaven knows what goes on behind closed doors with Nonis, Poulin, Lieweke, et al, but this team has proven to be a failure in the end. They need to find a coach who can serve as a good conduit between the front office and the players on the ice, and ultimately define this team. The game against St. Louis was not shocking, just revealing. You hit the nail on the head: as much as most of us love high-flying firewagon hockey with goals, since the mid '90s when New Jersey perfected the "trap", what the Blues do is generally what wins championships. For whatever reason, the Leafs have not been able to consistently adopt or adapt to Carlyle's system and how we wants them to play. While I tend to pin that on high-priced players who put stats ahead of winning (no "system" is beyond their reach- it's all about effort and winning battles), it's clear the coach must own some responsibility, too. I thought Lupul's supposed supportive comment this week was telling: he said, if I have the quote correct, that "it's not just the coach". By saying it's not "just" the coach, that tells me the players feel it really is the coach. In my view, they should be looking in the mirror. Solid post as always, thanks Pete. It's pretty clear that Carlyle either likes you or he doesn't and he's not going to change his mind about it. I've known people like that, in fact, I worked for one. (He liked me, thank goodness, but was miserable to a few other very honest, hard workers. He never changed his mind either.) It makes for a very uncomfortable and nervous work environment. As one of the favoured few, and liking these workers myself, it was very upsetting. There were players Carlyle didn't like last year and they are either gone or may be gone soon. I can see a player struggling eventually when they are met with this situation knowing they won't be rewarded for their efforts and one mistake will see you sitting, when others are making just as many mistakes. It's not a good situation for his team-mates either. MacArthur is a good example, part of a close very young core of players. Frattin is another, who I thought showed a great deal of skill and creativity, a lot like Kadri. The rumours are that Carlyle and Clarkson don't like each other very much. I wonder if this relationship is in part responsible for what we've seen from Clarkson. Burke brought in Lupul, Gardiner, Kessel, Phaneuf, Bozak, JVR, Komorov, drafted Kadri and Rielly, and re-signed MacArthur and Grabbo. He is resposible for the top two lines. There's always a bad contract or two no matter who you are. There's always risk involved. Nonis brought in McLaren, O'Byrne, Bolland, Clarkson, Bernier, Raymond, signed Ranger, re-signed some of Burke's core, re-signed Orr, and lost/traded/dumped for nothing- Komorov, Grabbo, MacArthur, Scrivens, Frattin, Koska, Fraser. We're still paying for Scrivens, Frattin on the cap. Holland is here only because it was necessary, Reimer may be gone by the summer. Defense hasn't been addressed. This doesn't look great to me. Clarkson may not want another year in Toronto under Carlyle, I have an awful feeling Lupul feels the same and we'll likely need a new back-up. Is Nonis giving too much say to Randy in many of the decisions made the past year? I won't even get into the UFA situation. It makes me dizzy. Too bad we can't turn back the clock a year and start again. C.N. Maple Leafs fans should talk to long-time Kings fans and see what they have had to say over the years about Tim LiesWeekly. I can assure you, most of it would not be printable in the Toronto papers.